Please bring your photo ID and proof of purchase for additional items to the packet pick-up. Want a friend to pick up your packet? Please send the following in order for someone else to pick up your packet: A Packet Pick-up Waiver (see below) and copy of photo ID or a copy of RunSignUp Confirmation. Unclaimed Packets: Unclaimed packets will not be mailed unless specifically requested. Please send request via email. 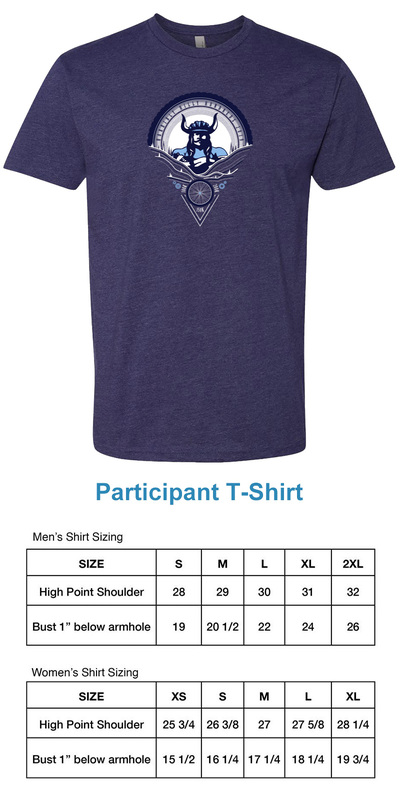 Participant must pay shipping and handling fee of $10.00. 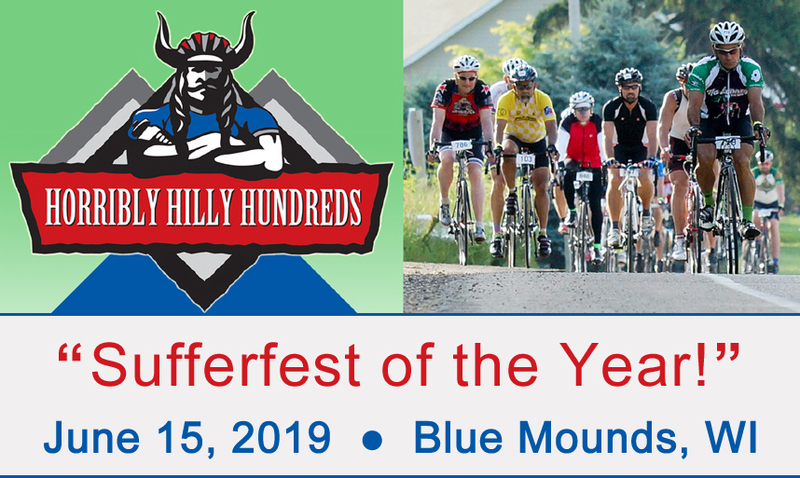 Official Ride Start Location: Intersection of Division St. and Main St. in the Village of Blue Mounds. This area will be barricaded. Riders will enter the corral coming down Mounds Road from Blue Mound State Park and following to the left on Brigham Avenue. When exiting the corral and starting the ride, you will receive your wristband, which will allow you access to the food and beer at the finish line. IF YOU START BEFOREHAND AND DO NOT ENTER THE CORRAL, YOU WILL FORFEIT YOUR WRISTBAND. 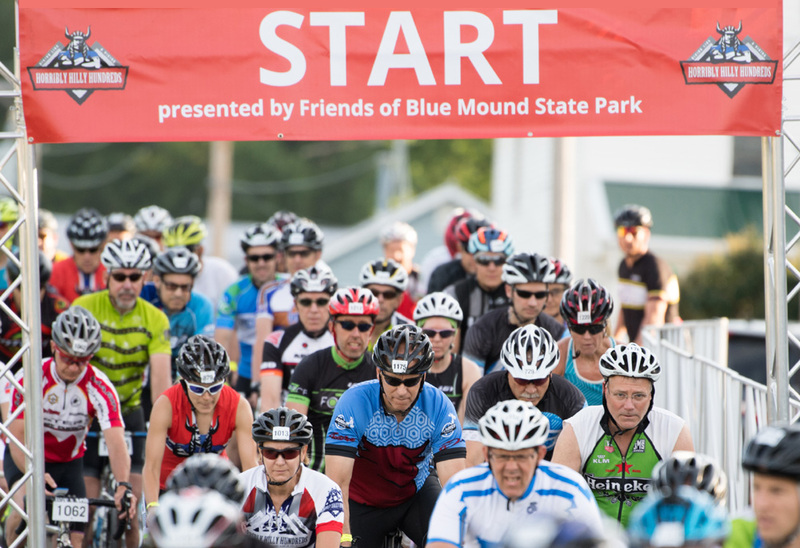 Parking: Please park your vehicle in Blue Mound State Park, or another legal parking area, then bike to the start line. DO NOT PARK AT OR NEAR THE BLUE MOUNDS GENERAL STORE! Proof of registration is REQUIRED AT ALL TIMES while on the Horribly Hilly routes. Proof of registration includes the visible display of BOTH your bib number and the wristband provided when you enter the start corral. Your bib number should be worn on the back of your jersey. Rest stop crews and course marshal staff will strictly enforce compliance with proof of registration. 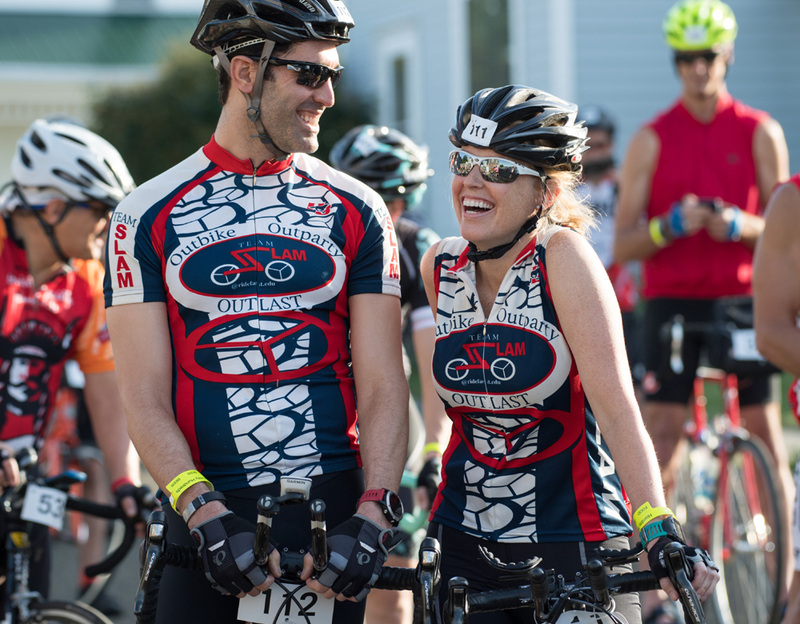 Failure to wear your bib and wristband will keep you from getting any support from rest stops or SAG/mechanical support and will result in forfeiture of post-ride celebration and/or future registrations. Abuse of the system by bandits will not be tolerated. Don’t steal. Don’t encourage others to steal. Anyone found to be an unauthorized participant faces penalties up to and including prosecution. You and your friends will be banned from future events if you are riding with friends that are not registered. Horribly Hilly Hundreds is a bike ride, not a race. Please keep this fact in mind as you prepare. ALL TRAFFIC LAWS MUST BE FOLLOWED AT ALL TIMES. VIOLATORS WILL RISK BEING CITED AND/OR FINED. Please respect the residents and municipalities who have so graciously granted us the rights to ride through their communities. Plenty of resources are provided along the course. We will not tolerate violations of law. Acts of trespassing, public urination, disorderly conduct, etc., could lead to sanctions including an event participation ban and/or prosecution. ** ELECTRIC BICYCLES ARE NOT PERMITTED. 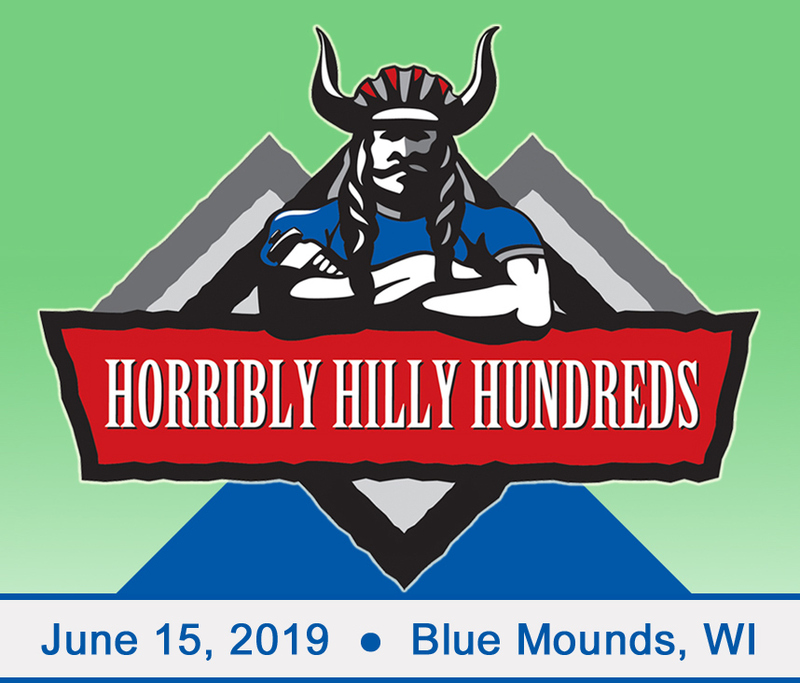 Registration for the Horribly Hilly Hundreds includes a day pass to Blue Mound State Park, including complimentary use of the pool and shower facility. The passes will be available at packet pick-up, but only take a pass if you need one. Please place day pass on the window of your vehicle and you will not need to stop at the entrance booth on the way in. 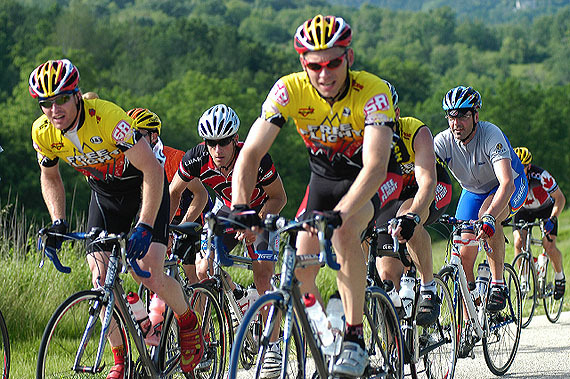 The 200K option of the HHH offers 124.2 miles of riding. You’ll climb 40 significant rises, from 50-foot bumps to the 910-foot final climb, for a total of 10,700 feet of elevation gain. The ride has four full-service rest stops, including bathrooms, at mile markers 24, 44, 65, 98 and the finish line. 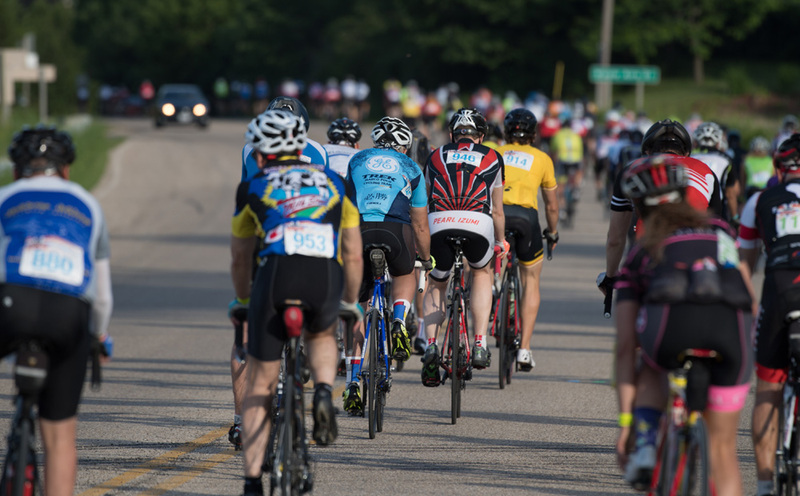 Leg C is the easiest, a respite in preparation for legs D and E. There will be mini-water stops at critical intersections where you can fill up your water bottle and get a banana or granola bar, but those will not have restrooms. Staying on the route is facilitated by maps, cue sheets, and adhesive arrows on the road. Sag wagons, medical support, and repair trucks will be available. Bring extra tubes and other spares, especially if you use sew-up tires or non-standard gear. We recommend a minimum of a 27-tooth rear cassette. Many successful completers of the HHH have used a rear MTB derailleur with a 32- or 34-tooth, or a triple crank. Ham radio operators will be manning the course. Stop any of them or a sag wagon if you need assistance. In the event of a serious emergency, use your cell phone or get to the nearest house and call 911. The 150K route features 9,300 feet of elevation gain. Full-service rest stops are at mile markers 24, 51, 75 and the finish line. Staying on the route is facilitated by maps, cue sheets, and adhesive arrows on the road. Sag wagons, medical support, and repair trucks will be available. Bring extra tubes and other spares, especially if you use sew-up tires or non-standard gear. We recommend a minimum of a 27 tooth rear cassette. Many successful completers of the HHH have used a rear MTB derailleur with a 32 or 34 tooth, or a triple crank. Expect 5,700 feet of elevation gain over 66.5 miles on this route. The 100K has full-service rest stops at mile markers 24, 42 and the finish line. Staying on the route is facilitated by maps, cue sheets, and adhesive arrows on the road. Sag wagons, medical support, and repair trucks will be available. Bring extra tubes and other spares, especially if you use sew-up tires or non-standard gear. We recommend a minimum of a 27 tooth rear cassette. Many successful completers of the HHH have used a rear MTB derailleur with a 32 or 34 tooth, or a triple crank.